...Edition". 2CD. 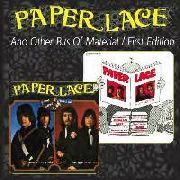 A 31 track double CD compiling the first two albums by mid 70 s hitmakers Paper Lace. Includes the international hit singles Billy Don't Be A Hero (UK No.1, Ireland No.1, Germany No.42, Australia No.1, USA No.96), The Night Chicago Died (UK No.3, Ireland No.5, Germany No.3, Australia No.1, USA No.1, Holland No.2) and The Back Eyed Boys (UK No.11, Ireland No.7, Germany No.28, Australia No.36, USA No.41). Also features the singles Hitchin' A Ride and So What If I Am plus ultra rare 45 s like Ragamuffin Man, You Can t Touch Me and In The Morning ; originally released on the collectable Concord label Contains many tracks making their debut on CD Booklet contains original LP artwork, loads of European singles sleeves and detailed liner notes by Phil Hendriks.